For all of you who do not know yet, Tropic Ice Unlimited Inc. of Salters in St. George, Barbados has lost its battle with the Landlord for outstanding rents for the property from which it operates or used to operate. This has resulted in the Landlord re-entering the premises, taking possession of the property and changing the locks to prevent all and sundry from gaining access into the building or conducting business with Tropic Ice Unlimited Inc. from that location. As many as twenty (20) employees who turned up for work this morning discovered the Landlord’s actions, which included the above together with the placing barricades around the entire premises and affixing signs (notices) all around the perimeter stating that the property was Private Property and that trespassers would be prosecuted. This will mean that not only employees but creditors and customers of Tropic Ice Unlimited as well are going to be monitoring developments closely within the next few weeks to see where they stand. Not surprisingly, the customers while affected by this major business interruption can always look for other suppliers of ice and bottle water but it’s the employees and creditors who could and most likely will be be most affected. The Landlord has been at loggerheads with Tropic Ice Unlimited Inc. for the last couple of years as it sought to collect reportedly hundreds of thousands of dollars in unpaid rent from the Tropic Ice Unlimited Inc. A confidential source has revealed that sometime during the course of this month, the High Court of Barbados granted permission to the Landlord by way of of an Order to re-enter and take possession of the property for the unpaid rents. The two major beneficial shareholders of Tropic Ice Unlimited Inc., Michael St. John and Chris McHale have been embroiled in bitter litigation for the last several years. These disputes centred around the fact that Tropic Ice Unlimited Inc. was operating from property at Salters owned by Michael St. John et al and who for all intents and purposes was (past tense) the Landlord. Michael St. John resigned from the Tropic Ice Unlimited Inc. in 2009 and has formed his own company, Glacial Pure and which now has a majority market share of the bagged ice and bottle water business in Barbados. Good old Goin’ wid Owen is challenging the DLP to “hurry up and bring integrity legislation to the floor of Parliament.” I guess somebody finally told him that the DLP are four years late with their promise. Of course, four years late with Integrity Legislation is nothing compared with the BLP never doing anything about it themselves for the 14 years they were the government. … Owen Arthur in The Nation article Bring it on! Cable & Wireless paycheque alright for some! Due to a Cable and Wireless problem we were unable to receive or send emails for the entire working day yesterday (Monday). The customer services number rang and rang unanswered until after 2 hours we were able to get through, to be told they had no idea when it would be restored. This is the second time in a month and it is costing businesses like us, thousands of Dollars. Just take it or leave it. 2/ Cable & Wireless CEO gets 45% pay increase!!! The chief executive of Cable & Wireless Communications (CWC) collected more than $4.3m (£2.7m) in pay and bonuses last year after the telecoms company’s highly controversial £30m private-equity style long-term incentive plan (LTIP) made its last payment. Tony Rice collected basic pay of $1.08m, cash bonuses and benefits of $466,000, pension contributions of $270,000 and $2.6m from the five-year LTIP plan. Rice’s total payment was 50% higher than the previous year, while the shares lost 17% of their value. Rice’s salary, cash bonuses and pension payment rose by 45% to $1.82m, while the amount he collected from the LTIP rose to $2.6m from $1.6m. The LTIP payment was larger this year because half of Rice’s payment for the previous year was deferred. Cable & Wireless CEO explains everything he thinks you need to know! A look at the other speakers scheduled for the April conference reveals some other folks who are also ‘doers’ rather than ‘pray-ers’ when it comes to helping girls and women who find themselves preggers, used and abandoned by the fathers of their unborn children. You know it’s all fine to pray with somebody, but if prayer isn’t accompanied by a place to sleep, a meal and some real assistance for a woman in need – then STFU and don’t bother getting involved in the first place. That should be the motto of ‘pro-life’ movement in my humble opinion: “Pro-Life? Then do something real or STFU.” You can tell I’m in a mood today. As far as the ‘Family Values’ side of this conference goes I’m not a fan of a lot of the baggage that usually goes along with that ‘code-phrase’, but that’s me and like Sarah Flood-Beaubrun I don’t mind a little water in the wine if young girls and women in trouble are looked after by somebody who doesn’t make a profit each time they talk some frightened soul into deciding to abort their child. How Robert Mugabe went from a man of the people to believing that he was God’s own gift to Zimbabwe, with a singular focus on maintaining his own power. Small hotel or 100 people around the pool? Tourists love small! Operating a small hotel, clearly I have to declare a bias towards this sub-sector. But from a national point of view in terms of revenue and employment generation, have we ever analysed which type of our diverse lodging offerings proportionally delivers the highest net income to the country year after year? What type of accommodation provides the most jobs per occupied room night and highest percentage turnover that remains in Barbados? And this should not include just the bed nights, but secondary spending in restaurants, attractions activities, car rental, shopping etc. We should then ask which sub-sector consistently achieves the closest to published rack room rates, without having to dramatically discount to attract tour operators. 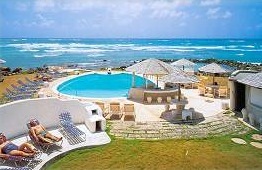 Then question which properties solicit the highest levels of guest satisfaction and repeat guests. If the world’s largest travel website, TripAdvisor, can be used as a barometer, does the fact that every one of the top ten rated hotels in Barbados are small have any significance? This really goes back to ensuring our national marketing organisation, advertising agency and public relations company, all fully understand the product. Perhaps many persons reading this column would be suprised to learn that there is no portion of the annual budget of the Barbados Tourism Authority dedicated to this niche. Nor is there a small hotels committee or product club and that the only trade body dedicated to this sub-sector, Intimate Hotels, has had it’s Government grant either severely pruned or eliminated altogether. Add to this, that out of our total of almost 160 registered hotels, nearly 120 are defined as small. Most people, whether inside the industry or not, understand that Government is under severe fiscal pressure and due to this even previously approved budgets have not been able to be implemented, to allow the full allocated funds to be used. I recently attended a general marketing meeting, where members were asked to put forward suggestions to combat, what at this time appear to be imminent softening flight loadings over the next couple of months. Call it naivety if you wish, but I believe there is always something that can be done, even if the overall effect might not redress the total problem. The stumbling block was, that even if solutions were proffered, the monies to implement the ideas were not necessarily available, at least not from the public sector. It’s a catch 22 situation for Goverment. If you don’t fill the rooms, you cannot collect the VAT payable, not only on the accommodation, but all the secondary spending. Add up all the other taxes the administration collects, like departure and income tax, NIS contributions and the benefits resulting from the redistribution of employee earnings into the economy. Without these, it makes it even more difficult for Government to pay the bills. Virgin Atlantic: Two for One to Barbados! Almost reconfirming the concerns about air lift, as this column was going to press, Virgin Atlantic launched a new Rewards offer for it’s Flying Club members called Two for One. For travel up to 31 May, two people can travel from Manchester or Gatwick to Barbados for 47,500 miles return. While taxes are still payable, it literally halves the normal cost of a ticket and I hope that our tourism planners make full use of this opportunity. Editor’s note: This story was printed as received from Mr. Loveridge, with the exception of the title and sub-titles that have been created by BFP. Some of the paragraph breaks were changed and bold/italics were added. Photos from BFP files. Barbados Advocate publishes story on Ocean Two resort’s TripAdvisor five-star award. It has been a month since Adrian Loveridge published an article at BFP urging the Barbados Tourism Authority to pay attention to TripAdvisor – one of the top travel websites in the world. (See Barbados Tourism Authority ignores TripAdvisor Travelers’ Choice awards). Considering that almost 90% of tourists have some form of internet use when making travel plans, you’d think that the BTA would be big on capitalising on the Internet. Apparently not. It’s been a month and nothing from the BTA on the TripAdvisor Travelers’ Choice awards. If we’re wrong, somebody please let us know… but we don’t think we’re wrong. 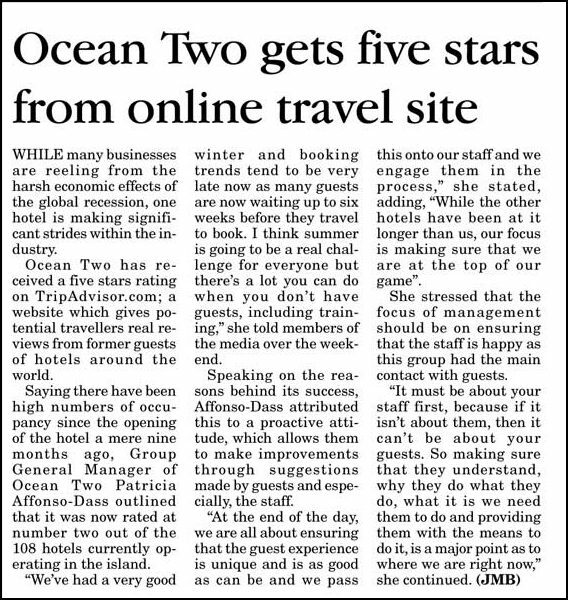 It’s good to see though that the Barbados Advocate published a little news piece that Ocean Two made a five-star rating at TripAdvisor. Five Stars is a big deal and should boost their occupancy although Ocean Two is doing excellently already. Every little piece helps in this economy. For the life of me, I don’t know what the Barbados Tourism Authority spends all their public money on. I see the results of the travel journalists’ free trips, but can someone please tell me where the BTA’s hundred million dollar a year budget goes? I might be wrong, but I just can’t see it.